Product #46684 | SKU EAP110-OUTDOOR | 0.0 (no ratings yet) Thanks for your rating! Extend the reach of your Wi-Fi network outdoors with the EAP110-OUTDOOR Wireless N300 Outdoor Access Point from TP-Link. 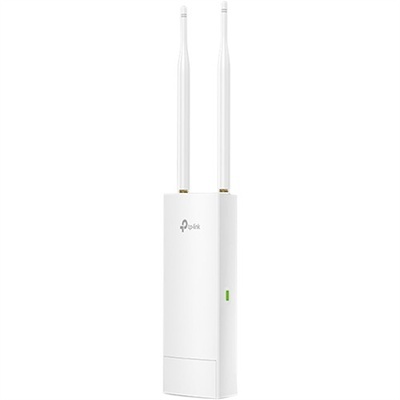 This wireless-N outdoor access point operates on the 802.11b/g/n Wi-Fi network standards and operates on the 2.4 GHz frequency supporting data transfer rates of up to 300 Mbps. In addition to enhanced wireless coverage and network speeds, this access point is designed to stand up against the elements thanks to the durable weatherproof housing. Installation is simple as the EAP110-OUTDOOR comes with both pole and wall mounting kits and supports PoE connectivity to eliminate the need to run a standalone power supply to the AP. Once installed, free Auranet Controller Software makes it easy to manage this AP as well as hundreds of other APs while the Captive portal simplifies the process of authenticating guests. With high transmission power and two high-gain omnidirectional antennas, EAP110-Outdoor provides stable wireless coverage at a range of up to 656' in outdoor settings.